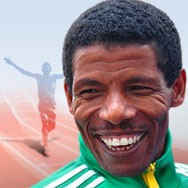 The Ethiopian athlete Haile Gebrselassie has been bestowed with the 2011 Prince of Asturias Award for Sports. The Jury for the Award announced its decision today in Oviedo. Considered the best distance runner of all time, Haile Gebrselassie is an extraordinary example of sacrifice and self-improvement who has been a leading figure among the sports elite for over two decades. His commitment to peace and understanding through sport and his humanitarian and social work in Ethiopia have made him an ethical role model for a whole generation of athletes worldwide. This nomination was put forward by Antonio Sánchez-Benedito Gaspar, Spain’s ambassador to Ethiopia. Haile Gebrselassie was born in Arssi (Ethiopia) in 1973. He was raised on a farm and had to travel 20 kilometres every day to school. This circumstance served as his training and influenced the way he runs: with his left arm crooked as if still holding his schoolbooks. His sports career began in 1991 at the Junior World Cross Country Championships in Antwerp. The following year, he participated in the World Cup in Seoul in the same category, where he won the gold medal over 5,000 and 10,000 metres. In 1993, he became the 10,000 metres world champion in Stuttgart, where he was also runner-up over 5,000 metres. He won the bronze medal at the 1994 World Distance Cross Country Championships in Budapest and gold in the 10,000 metres race in Goteborg a year later. That season, he won the Monaco Grand Prix over 3,000 metres and set the world record over 5,000 metres. At the 1996 Athens Olympic Games, he won the gold medal over 10,000 metres, a category in which he set a new world record. He retained his title in 1997 and set new records over 3,000, 5,000 and 10,000 metres. A year later, he won the Golden League in the categories of 3,000 and 5,000 metres, establishing new world records over 5,000 and 10,000 metres. In 1999, he became the 10,000 metres world champion once again, as well as winning the 1,500 and 3,000 metres indoors. He won the gold medal over 10,000 metres at the 2000 Sydney Olympics. In 2001, he won the bronze medal over 10,000 metres at the World Championships in Edmonton (Canada) and the half marathon in Bristol (UK). Two years later, he became the 3,000 metres indoors world champion and came fifth in the marathon at the 2004 Athens Olympic Games. After suffering an injury, he decided to specialize in the marathon and half marathon. In 2005, he set a new world record in the marathon in Amsterdam and in 2006 set new records in the Rock’n’Roll Arizona Marathon, held in Phoenix (USA). He won the Berlin Marathon in 2007, establishing a new world record. He came sixth over 10,000 metres at the 2008 Beijing Olympics. In all, he has broken 26 world records, beating his own record in the 2008 Berlin Marathon. He repeated this victory in 2009, a year in which he also won the Dubai Marathon, as well as winning the gold medal in this race once more in 2010. Last May, he won the Great Manchester Run (10 km race). He is the driving force behind The Great Ethiopian Run Initiative and one of The Elders, a group of Ethiopian personalities who have mediated in conflict resolution between the government, the opposition and civil society. He is a Goodwill Ambassador for the United Nations Millennium Development Goals and the UNDP, among other institutions, and has opened two schools in Bahir Dar and Assela (Ethiopia). In 1998, the International Association of Athletics Federations named him Athlete of the Year and the International Sports Press elected him Sportsman of the Year. In 1998, he likewise received the Jesse Owens Award from the International Amateur Athletic Association. In 2001, the publication Capital named him Ethiopian Sportsman of the Year and in 2004 he became a member of the IAAF Athletes’ Commission. The Association of International Marathons and Distance Races (AIMS) awarded him the Golden Shoe in 2006 and the Citizen World’s Fastest Time Award in 2007. In 1999, Disney Channel and 4 Films produced Endurance, a biographical film about Gebrselassie. This year a total of 19 candidatures from Argentina, Australia, Bolivia, Dominican Republic, Ethiopia, France, Italy, Lebanon, United Kingdom, United States and Spain ran for the award. This is the seventh of eight Prince of Asturias Awards to be bestowed this year for the thirty first time. The Prince of Asturias Award for the Arts went to Italian conductor Riccardo Muti, the Prince of Asturias Award for Social Sciences was given to US psychologist Howard Gardner, the Prince of Asturias Award for Communication and Humanities went to British institution The Royal Society, the Prince of Asturias Award for Technical and Scientific Research was jointly bestowed on neuroscientists Joseph Altman, Arturo Álvarez-Buylla and Giacomo Rizzolatti, the Prince of Asturias Award for Literature was given to Leonard Cohen and the Prince of Asturias Award for International Cooperation went to Bill Drayton. The Prince of Asturias Award for Concord will be announced next 7th September.